June 5 Thursday Pleasant but cooler, Mer only reaching 78°+ in P.M. Not as much cotton in air today, but enough still. All about as usual with us. 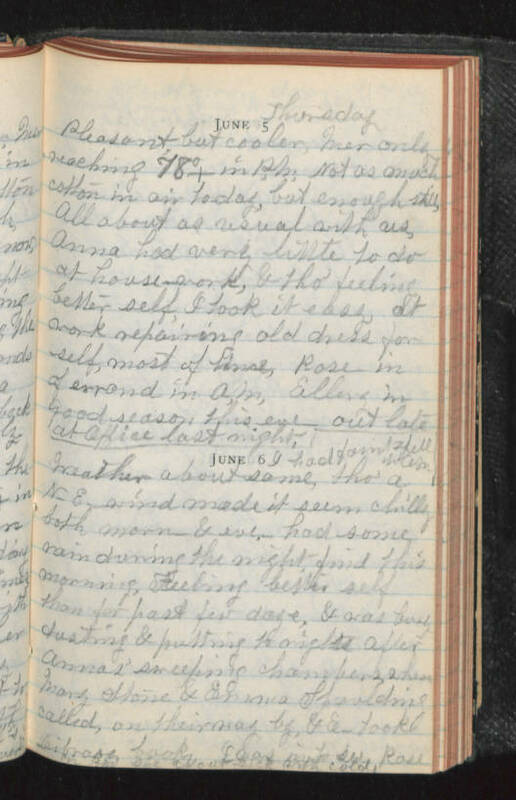 Anna had very little to do at housework, & tho' feeling better self, I took it easy at work repairing old dress for self, most of time, Rose in of errand in a.m. Ellery in good season This eve - out late at office last night June 6 I had faint spell in A.M. Weather about same, tho' a N-E- wind made it seem chilly both morn & eve. - had some rain during the night, find this morning, Feeling better self than for past few days, & was busy dusting & putting to rights after Anna's sweeping chambers, when Mary Stone & Emma Spaulding called, on their way by & E- took library books. Was in to see Rose in P.M. she about sick with cold.